Military science is the process of translating national defence policy to produce military capability by employing military scientists, including: theorists, researchers, experimental scientists, applied scientists, designers, engineers, test technicians, and military personnel responsible for prototyping. In so doing, military science seeks to interpret policy into what military skills are required, which, by employing military concepts and military methods, can use military technologies, military weapon systems, and other military equipment to produce required military capability. In Memoriam. Matthew Fontaine Maury. 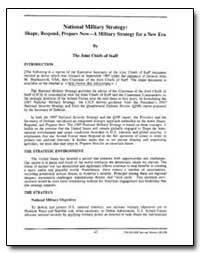 Introduction: The following is a reprint of the Executive Summary of the Joint Chiefs of Staff document entitled as above which was released in September 1997 under the signature of General John M. Shalikashvili, USA, then Chairman of the Joint Chiefs of Staff.